Before he died, George Pearce (1901-1980) recalled his early life at Lower Farm, Itchington. The day's routine started with a cup of tea at 5.30 am. George was sometimes joined by the local 'bobby' from Iron Acton who did a night round of Rangeworthy — Bagstone — Tytherington — Itchington — Earthcott, and had to leave his signature at various points for the sergeant to check. Lower Farm was one of these points, and the 5.30 am cup of tea became very popular. At 6 o' clock George saw the farm hands, the cows were brought in, and it was milking stools and pails until 7.30am. Breakfast at 8am was usually porridge, egg and bacon. Then from 8.30 to 1 o'clock, it was work on the farm, with a brief 'lunch' break at 10. Dinner time varied between 1pm and 2pm, and if the work in hand was at the more distant parts of the farm, a 'picnic' was taken. Milking again from 4pm to 6pm, then tea or cider, with bread and butter. The last meal of the day was at 10pm. There was a cooked meal every day, but not always at the same time. The farm produced its own cheese, single or double Gloucester and cheddar, butter, ham and bacon; occasionally a salmon was smoked. Each year, 1,000 gallons of cider (pressed at Malt Farm) and over 100 gallons of beer (stopped one year by the Excise men) were made, for every worker on the farm was given half a gallon of cider or beer a day. Up to 1914, the farm employed an average of six men or boys, sometimes up to eight, never less than four up to 1970. Albert Godsall was cowman for 60 years, Fred Alway ploughman and carter for 60 years, Bennie Clements, son of the Earthcott blacksmith, was employed up to his death, and for a period all three Pearce sons worked on the farm. There were three ploughs; almost all ploughing was done by two horses, for the only really heavy field was called 'sniping' or 'six-horse field'. A tenant farmer had to seek his landlord's permission before ploughing up pasture, and this was seldom granted. 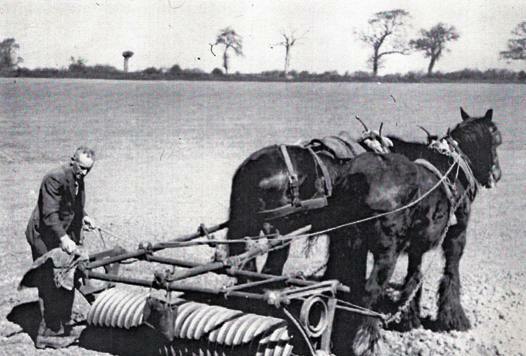 Also among the machinery were a harrow, a cultivator, two bushes or rigs to drag over grass, two horse rakers, two mowing machines, two swath turners, and two pole elevators — apart from one still preserved at New House Farm Tytherington, the only ones in the parish, later superseded by a trough elevator. The loose hay in the stack was then baled one at a time in a primitive machine. Thomas Rugman, who lived up on Itchington Common, did this work for the Pearces. Threshing was done by a contractor; four horses were needed to haul the machine to the farm. There were farm wagons and a trolley on the farm, and a horse and trap. When the fields were too wet to take the trampling of the horses, George sowed seed broadcast by hand, many hundreds of acres in his time. Weeding was all done by hand. Wages were low, though permanent workers were housed rent-free and had free milk. Later on, Lower Farm had its own electricity generator; the mains came to Itchington long after Tytherington had been connected. Photograph right shows Arthur Clements rolling his fields at Grovesend, now part of the quarry. George's father went to the Corn Exchange in Bristol regularly once a week, by train. If on occasion the whole family went, they would go in a horse-drawn vehicle, leave it in the yard of the Black Horse at Eastville, and go on by tram. Many farmers went to Thornbury market by train, catching the 5.10 back, some returning home somewhat later, via The Swan. George remembered three of the fairs which in Tytherington were called The Revel. One was in the field opposite the Village Shop, one behind Yew Tree Farm, and one in The Swan yard. A highlight was when Squire Hardwicke gave George and his brother Lionel sixpence each for rides on the Helter-Skelter. The Pearces, and everyone else from Itchington, as many as 15, walked to church on Sundays, never riding in a horse and trap. The parson, the Rev Mr Arkell, was a fierce disciplinarian, banging and shouting at the choir practices; as a choir-boy, George once went on strike — but didn't he catch it from his father on Monday! This choir-boy strike was confirmed by Charlie Davis (of the Old Chapel), a choir-boy at the same time. George's father was a Church Warden for sixteen years, George himself for almost twenty five.